Joe Kelly, TVM Terminal Agent is scheduled to retire June 1, 2018 after almost 42 years of dedicated service to NJ Transit and Conrail. Joseph Kelly begun his career December 10, 1976 with Conrail Immediately after he graduated from Dover High School at the tender age of eighteen. He was especially excited to become a proud union member of the Brotherhood Railway and Airline Clerks (BRAC), currently known as the TCU Transportation Communication International Union. He was hired as a Tower Operator, which meant that he was responsible for the safe movement of trains within interlocking under the direction of the train dispatcher. Joe held many positions with Conrail such as, Freight Agent, Ticket Agent, Tower Operator etc. Then, in 1983 NJ Transit was established to handle the passenger service of Conrail, while Conrail continued to provide freight service. Conrail employees were given the choice to remain with Conrail or transfer to NJ Transit. 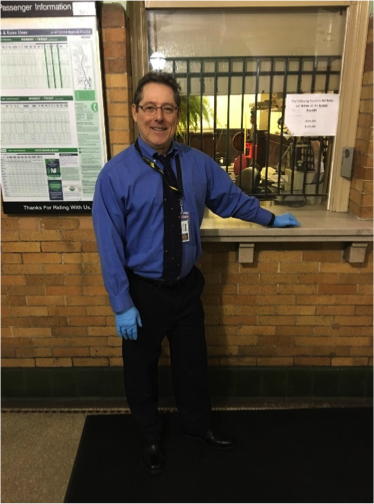 Joe enjoyed serving the public, so he decided to transfer to NJ Transit and put his interpersonal skills to use. Joe again worked many positions within his craft until eventually being awarded the TVM Terminal position at the South Orange station in 1995. During his career Joe had many opportunities to bid for a higher wage or relocate to another work location closer to home, but Joe considered his South Orange customers as family. He said that he will not miss waking up at 4am in the morning, but after 23 twenty-three years of developing wonderful relationships with the South Orange customers, he would definitely miss his work family. Joe is one of five children and he grew up in Dover, NJ. Joe is most proud of his beautiful intelligent daughter Cassandra. Joe Kelly’s, father, Joseph Kelly Sr. was also a railroader. His Dad started with DL&W Railroad in 1952, and retired with NJ Transit as a conductor in 1982. Joe’s mother Elfriede Kelly is so delighted to witness the retirement of her son. Joe enjoys working out at the gym, fishing, cooking, and fine wine. His plan is to travel the world with his lovely wife Karyl. Joe is well respected amongst his friends, colleges and the Management staff. he will be missed dearly, but never forgotten. Well done! The post On June 1st TCU Member of 42 Years Joe Kelly will Retire appeared first on IAMAW .